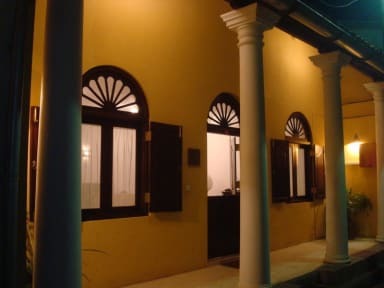 The villa has a direct view of the sea and the ramparts. The ramparts, the Lighthouse, and the old Light house are just minutes walk from the villa. The interiors at Fort Bliss are spacious, airy and well equipped. The ground floor consists of a living and dining area and one bedroom opening out to a narrow strip of garden. The upper floor has three more bedrooms with sea views. 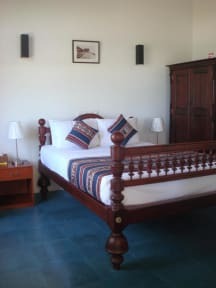 The four bedrooms are spacious and furnished with antique twin or double beds, almirah and work desk. In-room facilities include a/c, overhead ceiling fans, and safe. The ensuite bathrooms have hot water showers.